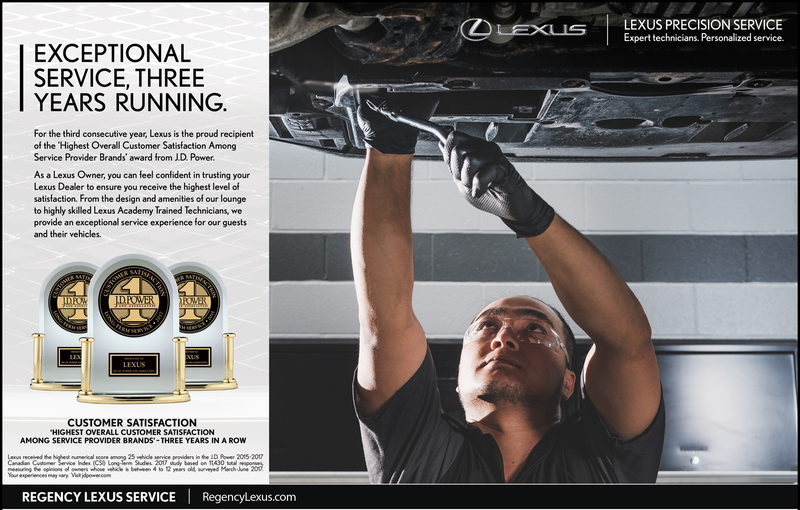 Beyond expert servicing by our Lexus-trained technicians, the highest-quality overall experience and attention to detail is the standard that each Lexus Guest can expect when they visit a Lexus dealership. This heightened level of care is part of our ongoing quest for the very best in service excellence — a level of excellence for which Lexus dealerships have gained national recognition. For the second year in a row, J.D. Power has awarded Lexus Canada dealerships the highest rank in “Highest Overall Customer Satisfaction Among Service Provider Brands”. This prestigious recognition is based on a study of more than 12,340 Canadian vehicle owners whose vehicles are between 4 and 12 years old. The study measures overall satisfaction based on five key factors, including: service initiation; service quality; service advisor; service facility; and vehicle pick-up. At Lexus, we’re proud to be recognized for our service expertise, commitment to quality and focus on customer service — adding to the sincere pride we take in each and every Lexus Guest experience we create. Our entire organization is committed to ensuring your complete satisfaction with your Lexus automobile. From the earliest stages of design, through testing, manufacture, and delivery to each new Lexus guest, our commitment is evident in the automobiles we have created. Our goal is simply to design and build the finest automobiles in the world. When you buy any Lexus product, you can count on superb quality, reliability and dependability, the foundation upon which our reputation was built. Did you know that to prove their dexterity, Lexus master upholsterers must be able to perfectly fold an origami cat with their non-dominant hand, in under 90 seconds? This elite training doesn’t stop at the factory, because Lexus treats perfection and developing human skills as a process that lasts the lifetime of the vehicle. Your Lexus automobile is delivered to you in perfect condition. In the factory, all Lexus workers are supervised and trained by “Takumi” master craftsmen. Takumi are so skilled they can feel imperfections that are invisible to the human eye. Each Lexus undergoes multiple inspections during assembly and is stamped at each inspection location to validate that it left in perfect condition. It is further inspected after transport from the plant to our distribution facilities, and your Lexus Dealership performs a two hour pre-delivery inspection before your Lexus is transferred to your hands. Each Lexus Dealership has a Diagnostic Centre and specially trained Master Technicians available to ensure that your Lexus is maintained or repaired correctly the first time. In the unfortunate event that your Lexus is involved in an accident, your Lexus Dealership will professionally restore it to pre-collision condition using high quality original equipment parts, and highly qualified collision repair personnel. From your first visit to your Lexus Dealership, through the sales and service process, and throughout your ownership, you will discover that the pursuit of perfection is a mission Lexus fully intends to maintain. This pursuit is demonstrated at each interaction – each member of the Lexus family is committed to treating you as they would a guest in their home. We wish you many years of driving pleasure in your new Lexus automobile. Above all, we are committed to continuous improvement. If there are any improvements that we can make to help ensure your satisfaction, please Contact Lexus.